...decided to stop posting the updates, since noone will read it anyway. If you just did - you can leave a message, I keep it more or less up to date (mobs are a tough one to work on, though I try to make improvements here and there.). Minecraft customizer page, for different ores, grass, foliage and screwed up pack. Still thinkng about items as weird. Leather. Not quite good, though I don't have any ideas. Halp. Fancy gold one is fancy. Came out about the way I wanted it to. Technically pack is WIP, so any ideas/suggestions/constructive cryticism/additions are highly appreciated. Just what we needed. Another simple pack! Not to sound too harsh. Huh, comments better than I expected. Yep, it's exactly what I was making. Wow this is an awesome texture pack minus the orange colored grass. I love the way the lapis and obisidion blocks look. I am going to use this for redstone builds. Both orange and green packs share the same armor textures. Kick me if you want them greener. First, I like the pattern you've begun there. If you can create a cohesive pack that is not (preferably) based on neon orange with a particular pattern and some detail, people will appreciate it. It is not easy to keep everything in the same pattern. Alternatively, you could tone down the neon brightness a lot on the orange and keep it with the unusual orangey theme. If you're going for a dead-ish grass theme (as it appears, looking at screenshots), make it yellower and add a tinge of green to assist with that. Donate to help me buy people Minecraft accounts! Well, that is what I'm putting the green version for, but, well, I thought about redoing the pack closer to usual colours, and leaving the current as 'classic' noone will like except for me. Well, what worries me the most is - colour of gold, how to make fitting ore details (though personally I love how the stone/ore looks right now, so probably just a little noise), what to do with the leather armor and mobs. Also, made planks/plank-related block textures (sorry, no entity skins, only blocks. To be honest, I don't mind the orange grass. Here's the thing, you did something different, and that's what makes this special. Just remember, hater's gonna hate. I like what you're doing here, and I'm sure others will too. 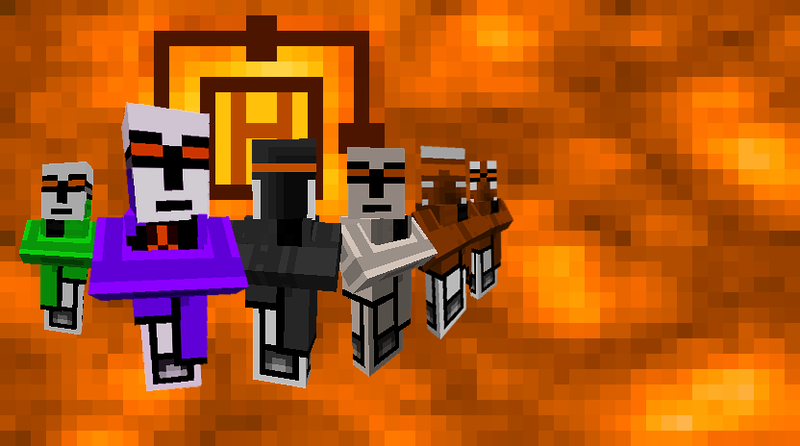 As for the ore, I think you could make it more like the orange block in the OP picture. I think its the pumpkin BRICK block, with the four squares in the centre, add those to the ores. It would probably do the job. Again, I quite like this. Keep at it! Mr. Skeleton is displeased with your lack of smilies. Arrows will be shot. Don't say you haven't been warned. I tried to draw the ores as you suggested, and they look veeery neat, especially once harvested, I'm thinking about making them with some noise in the squares... I just can't decide, I like the ones that are currently in the pack as well, they have a very clean look, I don't really know, why I like them so much, but they are the kind of design you want to lick, as for me. The orange grass can be reimplemented, though I'm not going to make the ground orange again (maybe a little), and I may just add it in the texture pack as alternative terrain/grasscolor. Added different grass and ores in minecraftcustomizer. Enjoy.